Make sure the power is off before you change a circular saw blade. Circular saws come in many shapes and sizes and they can be used for tasks as diverse as cutting heavy-duty timber to precision cabinet-making. There are blades for cutting metal, plastic, ceramic and even concrete, as well as a whole range of wood-cutting blades. Almost all circular saws use a nut or Allen screw to hold the blade to the arbor. Blades are easy to change when you use the proper tool and take sufficient care. There are two drive mechanisms used on circular saws: direct-drive and worm-drive. The direct-drive arbor is directly connected to the motor while the worm-drive arbor is connected to a series of gears that are in turn connected to the motor. The gears give the worm-drive saw more power and it is the choice of framers and construction professionals who regularly cut heavy lumber. Worm drive saws exchange convenience for power, however, and with their gears and the rear placement of the motor, they are quite a bit heavier and bulkier than direct-drive saws. Battery-powered circular saws have been on the market since the late 1980s and have, in recent years, acquired more power and longer battery life. The main drawback to battery saws has been that they are smaller than standard direct-drive saws and have smaller blades. Gradually, however, designs are allowing for 5 3/8-inch blades to be replaced by 6 1/2-inch blades which can slice through a two-by-four in one pass. This upgrade, together with the convenience of battery power, is giving the battery saw a home in more and more carpenters' tool chests. Wood-cutting blades are either steel-tipped or carbide-tipped. Carbide gives the blade a longer life, but also a larger kerf, or thickness, which makes it less desirable for precision work. 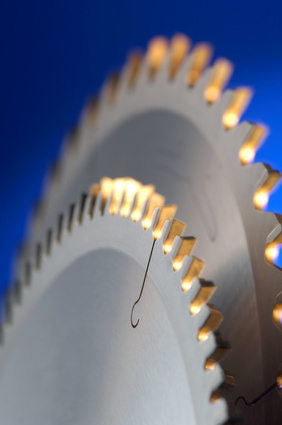 Wood-cutting blades can have anywhere from 26 to 100 teeth. Blades with fewer teeth are good for rough carpentry while those with more teeth are used for precision cutting of cabinetry plywood. Besides wood cutting blades, there are diamond-tipped blades for cutting masonry and ceramic, smooth blades for cutting metal, special non-ferrous blades for cutting aluminum and no-melt blades for cutting plastics. Use a scrap piece of wood to support the blade while you use a wrench or Allen key to loosen the nut holding it to the arbor. You can stop the blade from moving by digging the teeth of the blade into the wood as you apply pressure to the nut or inserting a screwdriver into the hole on the blade designed for this purpose. Some saws even come equipped with a locking mechanism. Remove the nut and the collar holding the blade to the arbor and then remove the blade. Put on a new blade with the printing on the blade facing out. This will ensure that the teeth are facing in the right direction. Replace the collar and the nut and tighten the nut using the wood, a screwdriver or the saw's locking mechanism to hold the blade. It is extremely important that you unplug the saw or remove the battery before changing a blade. An inadvertent pull on the switch while you are torquing on the wrench will be disastrous if the saw has power. Always tighten the screw securely. The blade can slip while you are cutting if you don't, causing a hazardous kickback. Make sure, also, that you are using the correct size blade for your saw. One that is too large could damage the saw casing and send plastic splinters or metal shards flying.